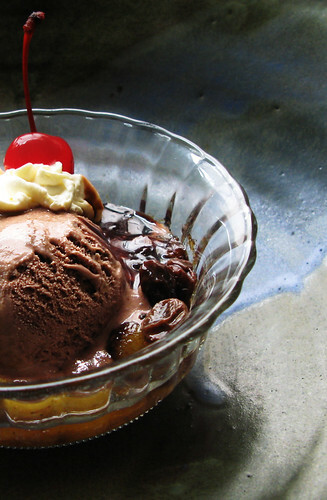 Not surprisingly, Banana Split in French is still Banana Split. I implore any French readers to come up with the official translation. 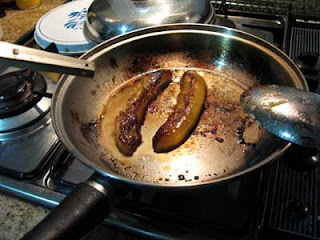 For now, I'll call it Coupe Bananes Français avec Bananes Flambée. I got the idea from Chocolate Desserts by Pierre Hermé (again), but I thought I'd put my own twist on it, plus I get to try something I've never done before-- that is, to flambée something. In any case, the toppings are rum raisins, chocolate sauce, whipped cream, and a maraschino cherry. I'm a big fan of saving dishes so we don't have to wash so much, so I made the rum raisins in the microwave. In a small ceramic bowl, I combined a few raisins, and 1 part rum (I got Tanduay White) to 1 part water. 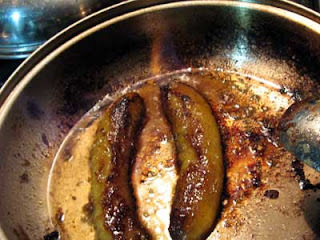 Heat it for 2 minutes over low power, then let macerate for at least two hours. I've never witnessed a flambée before, except this one time when they had the sauce (I think it was Mango Jubilee at Mario's?) in a gravy boat, and they ignited it in the boat. Which was nice to see, I guess, but without much instruction, I still wanted to try it myself. Again, put together your mise en place. You'll notice that there is a lid nearby, and that is to put out any overzealous flame. Of course, during cooking, the bottle of rum is not that near to the flame. Ahem. 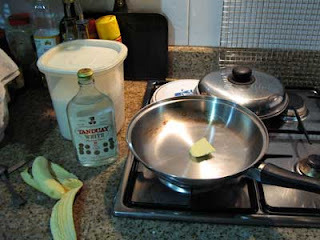 Anyway, melt the butter over high heat, and when sizzling, add the split banana and sprinkle with sugar. You do want a nice caramel color, but you don't want to cook it too long as the line to mush is a thin one. And I think I crossed it. Anyway, don't be shy with the flame and it will be over in a matter of seconds. The classic way to set your flambée alight is by tilting the pan so the liquid touches the high flame. I wasn't about to do this since I could easily spill the contents in my clumsiness, and instant grease fire. I played it safe and used a cheap igniter. So, once I take the bananas off the heat, I splash the rum in, and light it up. Do you see the flame at the 11-12 o'clock position? I barely can. If you're scared that you might cause an inferno doing this, it will delight you to know that the flame was quite impotent and wimpy, and would no doubt give its lunch money to Mr. Hand-Pulled Noodles and Mr. Puff Pastry without a fight. I however still have my Y chromosome (last time I checked, ha ha) and I was pretty pissed that the flame didn't consume my dish. Oh well! Thank heavens for small favors. It turns out, I'm not a big fan of rum raisins. Live and learn!